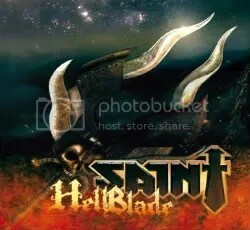 Spreading my metallic wings yet again, Saint is a band I’ve never tried before but I kept reading so many positive words about Hell Blade, I picked it up in early 2010. The printed words that grabbed me most about this group were “Judas” and “Priest”. I read more than one review comparing Saint to the Metal Gods, and it’s not as if this band is a clone and set out to out-Priest Priest, but you can certainly hear the influence. For example, “Crying In The Nights” sounds like some lost piece of cheese Priest might’ve recorded for Turbo. Other than the music, the main similarity between these two bands is the vocals. Josh Kramer’s delivery comes off very much like Rob Halford even if he does not display the same piercing cries. So I’m told Saint is a Christian metal act but you wouldn’t really know it. Religion, evil, Hell, end of the world, etc. has always been heavy metal fodder and the album cover is pretty darn heavy metal and doesn’t tip you off to this band being a Christian act at all. They don’t beat you over the head with their beliefs like some Christian acts do. If anything, when I first heard of Saint, I thought their name was meant to be ironic and I had the idea that the played a much more darker, heavier type of metal. Luckily, they don’t. It’s good ol’ traditional heavy metal through and through! Good metal is good metal and Saint’s Hell Blade is entirely comprised of it! This album is a solid addition to any metal fan’s collection and I plan on checking out their earlier stuff as well.